Our girl pilgrims wear bonnets, aprons, and carry baskets for our program. Our aprons were made a few years ago by a mother trying to get rid of some white curtains she had around the house. 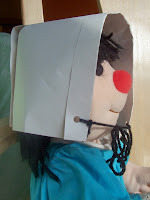 She folded over one end and sewed it, then thread a ribbon through. The bonnets we make are a little more difficult. I hope you are able to understand the directions, I have lots of pictures. 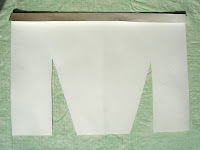 Fold the piece of paper and draw a line 3 1/2 inches from the side and 5 1/2 inches high from bottom. Then draw a diagonal line from the top of the straight line down to the bottom of the paper--you want to make a slim triangle. Cut out the triangle. 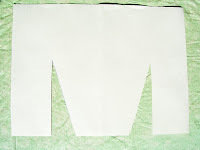 When you open the paper up, you will have something that looks like a big "M."
Fold back about 1/2 inch of the top of the paper, punch two holes, one on each end-going through the fold and the paper. Tie some yarn to these holes. Now here's the tricky part: the folding. 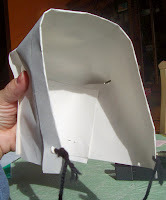 Pick up the bonnet and fold the two outside pieces so they come together in the center, glue or staple these together. 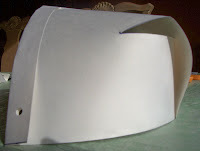 Then fold down the middle section of the bonnet so the bottom edge is even with the bottom of the two outside pieces that were folded inward, glue or staple. 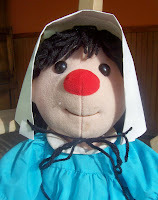 Finally tie it on your pilgrim girl and she is good to go. GOOD LUCK! I think it sounds harder than it is.